Do you love free stamps and paper as much as I do? Then this post is perfect for you! I answered the color challenge at Pals Paper Arts and I used three items from the Sale-A-Bration brochure. I them earned by purchasing $150 in Stampin' Up! products. Of course I still earned 10% on my order as well--more freebies! Here you can see that I stamped the flowers from Flowering Fields in VersaMark and embossed with Clear embossing powder. I used my Blender Pen to pull color from the lids of the Calypso Coral and Old Olive ink pads and colored the leaves and flowers. Lost Lagoon is the color of this print from the Wildflower Fields Designer Series Paper as well as my card base. I used Lost Lagoon ink to stamp the birthday sentiment from the free Sky is the Limit stamp set (today is the last day to get this stamp set free!). My "button" is four layers of Basic Black card stock punched with the 3/4" Circle Punch. I glued them together and added an Old Olive Baker's Twine bow. I love the black as it adds a crispness to the other colors. Thank you for looking today. 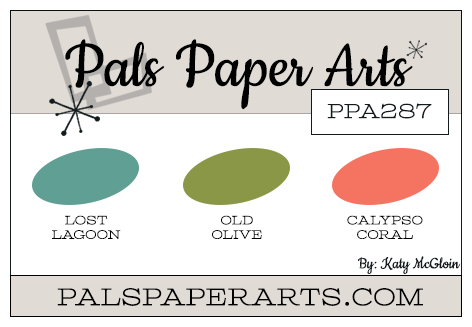 Maybe you are considering playing with the Pals Paper Arts Challenge? Do it! It's not too late! Please use my Online Store to order your products and choose a free Sale-A-Bration item for EACH $50 you spend! Beautiful April Showers card. I love the coloring of these light and fragile blossoms. Thanks for playing with the Color Team Patti! Such a soft card..very pretty! Glad you played along with the color challenge this week! What a soft and sweet card, Patti. I love how you've created these flowers - such a creative technique. 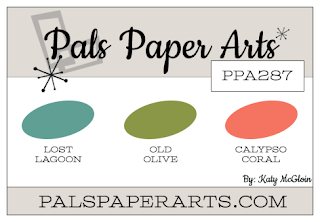 Thank you so much for playing along with this week's Pals Paper Arts Sketch Challenge. Love the soft look of those flowers. They look like they're floating on air. Thanks for playing with Pals Paper Arts.